Earthquakes are not considered a serious threat by many North Carolinians, although dozens of earthquakes have been recorded in the state since 1755. An earthquake may be defined as a shaking or trembling of the earth's crust. The modern theory of plate tectonics holds that the surface of the earth, or lithosphere, is composed of a dozen or so rigid plates moving slowly on a much softer layer of mantle, known as the asthenosphere. The friction between these plates is immense, and as they move against one another they sometimes get stuck; stress builds up, and when the plates are finally released an earthquake results. Interestingly, North Carolina falls within an "intraplate zone," an area that should, according to the theory of plate tectonics, remain relatively free of earthquakes. As a consequence, the more than two centuries of earthquake activity observed in North Carolina (more than 80 events by most accounts) are not easy for students of the plate tectonics theory to explain. Certain areas of the state, such as the Blue Ridge escarpment, are apparently more seismic than others, although active faults have proven difficult to identify. Fortunately, most of the state's earthquakes have been fairly mild, causing little if any damage. Had they been measured, they likely would have registered somewhere between 2.0 and 3.0 on the Richter scale. The most serious quake to affect North Carolina in modern times was the great Charleston, S.C., quake of 31 Aug. 1886. Estimates have placed it at 7.7 on the Richter scale, although it would have registered much more weakly in North Carolina. It was felt throughout the state, toppling numerous chimneys and cracking walls but causing no deaths or injuries. The very strong New Madrid, Mo., quakes of 1811 and 1812 were also felt throughout North Carolina. The most important earthquakes to have epicenters within the borders of North Carolina were those of 21 Feb. 1916, 20 Oct. 1924, and 2 Nov. 1928. Their effects were concentrated in western North Carolina, and no significant damage was reported. North Carolina's most notorious earthquakes also took place in the western part of the state. From February through June 1874 the present-day Lake Lure area was rocked by a series of as many as 100 mild shocks. Their epicenter was a mountain that later came to be known as Rumbling Bald Mountain. Although mild in intensity, the quakes received national attention. Some even speculated that North Carolina had an active volcano on its hands, although nothing materialized. A seismograph has been in place at the University of North Carolina at Chapel Hill since 1953, and earthquake activity in the state has been continuously recorded ever since. Research continues on the seismicity of the region, especially as pertains to the Charleston events of 1886. The current understanding of earthquake phenomena in North Carolina does not preclude the possibility of a severe and unprecedented event causing serious damage and great loss of life. In 1988 Robert Ketter, director of the National Center for Earthquake Engineering Research at the State University of New York at Buffalo, predicted that a major earthquake would occur in the eastern United States by the year 2010, though little attention has been paid to earthquake-resistant buildings and preparedness in this area. Gerald R. MacCarthy, "An Annotated List of North Carolina Earthquakes," Elisha Mitchell Scientific Society Journal 73 (1957). L. Seeber and J. G. Armbruster, "The 1886-1889 Aftershocks of the Charleston, South Carolina, Earthquake: A Widespread Burst of Seismicity," Journal of Geophysical Research 92 (1987). Harper's Weekly illustration from 11 Apr. 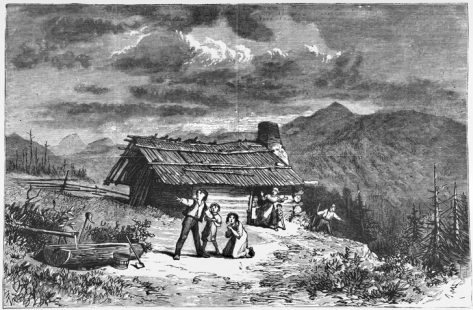 1874 showing terrified settlers outside their home on Bald Mountain in Rutherford County during one of the earthquakes that struck the area during the first half of that year. North Carolina Collection, University of North Carolina at Chapel Hill Library.